It’s always subjective as to which hockey playing nation is better than the rest, since results in important tournaments usually vary from year to year, sometimes month to month. However, we (Canadians, that is) always like to believe that we’re just a step ahead of everyone else, including the dreaded Russians. Some would make the claim the Russians are currently the best country in the world when it comes to playing hockey. They have had some very good results in tournaments the past couple of years. As unbiased as I can be, which is not completely, I can say that at just about any point in time, including now, Canada has probably been the best at our favourite sport. When it comes to the number of quality players, Canada far outranks any other country in the world, including many that are far more populous than the great white north. Certainly this country’s never been worse than 1A to whoever’s number 1. With the exception of the late 1970s and early 1980s, a low point for the quality of our players compared to the Soviet Bloc. The Russians haven’t been and aren’t the only challenger to Canada’s place at the head of the hockey world. Along with the Russians, Sweden, the United States and Czechoslovakia (later Czech Republic) have been able to make reasonable claims to the title at various times. But it’s most often been the Russians who’ve been the main challenger to Canada for world hockey supremacy. Even though Canada had been playing the Russians (in the form of the Soviet Union) since 1954, it wasn’t really until the 1972 Summit Series that the rivalry really took hold. Seen purely as an exhibition series, pitting the NHL’s best players against the Soviet ‘amateurs’, it grew to become much more when the seriousness of the challenge the Canadians faced became obvious. As most everyone knows, the Soviets shocked Canada as the series started and held the advantage into the second half of the series overseas, until Canada made a miraculous comeback to edge their foes with a late goal in the last game. It’s been said that the worst thing for Canadian hockey was to pull that series out of the fire. While our players might still have been better than the Soviets in 1972, they could have learned much from the Europeans about conditioning and training methods, team strategy and improving the basic skills, especially skating. As it was, the smugness among Canadians before the tournament, returned afterwards, since we had still beaten them despite all the factors going against Team Canada. Many Canadians, including people running the hockey business, seemed to believe what happened early in the tournament was mostly a mirage. We’d be ready for them next time. We missed a great opportunity to take more from the series than we did. Encounters with the Soviet hockey machine in subsequent years would dispel the notion the ’72 Summit Series had been a fluke. The Soviets played an eight game series against the fledgling WHA All-Stars, winning four, losing one and tying the remaining three. The WHA didn’t get a lot of respect from a lot of the hockey people in North America, but its team was full of quality players, including legends Gordie Howe and Bobby Hull as well as other former NHLers, who’d made the jump to the junior league, like Marc Tardif, Paul Henderson (the hero of the ’72 series), Gerry Cheevers and Frank Mahovlich. The NHL and the Soviets got together on a dozen different occasions to play the so-called ‘Super Series’ starting from 1976 to 1991 . Most were exhibitions between NHL clubs and Soviet club teams, although the Soviets National Team did represent their country in a series more than once. Over the 15 years these exhibitions were contested, a total of 98 games were played with the Soviet representatives winning 55 of them, while tying 10 and losing just 33. The Soviet teams consistently proved to be at least a match for the NHL clubs (there wasn’t a great deal of parity in the Soviet league because most of the national team players tended to be assigned to a few teams – these were always the teams that travelled to North America for these ‘club team’ matchups). Differences in the way North Americans played the game as opposed to the Soviets were easy to see when the two met. The Soviets emphasized team play and intricate passing while the NHL game still included a lot of individual rushes. Strategies were often different: we wondered why all 5 Soviet skaters would turn around and circle back to start a rush over again, something you’d never see in the NHL. They would never settle for shooting the puck into the opposing end to fore check in order to get it back. They didn’t pull their goalie when they trailed with time running out. They played wingers on the ‘wrong’ side of the ice, so their forehands faced the centre rather than the boards. They prepared in ways we were completely unfamiliar with. Their practices included drills we’d never seen and their conditioning included ‘dry land training’ which was then unheard of this side of the pond. The biggest difference between the Soviet players and most Canadian or North Americans was the sport’s most basic component of all: skating. This difference was most apparent when we played best on best exhibitions against our Communist rivals. Though these strengths were also apparent in other Europeans, especially the Czechs and Swedes, it was with the Soviets that these strengths were the most obvious. All-Star contests became far less competitive than we’d seen in the ’72 Summit Series. The next best on best series involving the Soviets and Canada was the 1976 Canada Cup. Going into the tournament the brain trust of the Soviet team, which included USSR hockey guru, Viktor Tikhonov, was roundly criticized for the final roster they decided on. Most of the criticism was based on the decision to go with a number of young players who were new to the national team. Ironically, they didn’t make it to the final round, losing to Czechoslovakia and Canada, as well as tying the Swedes. Canada still needed one of the best teams ever assembled, certainly their best to that point, to defeat the Czechs in the best 2 of 3 final. The team included many of the best players from the ’72 team, the NHL’s best player in 1976, Guy Lafleur, and two other all-time greats who weren’t available in 1972, Bobby Hull and Bobby Orr. It took this kind of a roster to defeat Czechoslovakia in 2 straight games. Once the Soviets stopped complaining (they grumbled about officiating and scheduling, among other things, at the Canada Cup), they went back to the drawing board. The Soviets’ national team soon proved to be better than ever. For the period of 1977-1981 it would be hard to argue that they weren’t the best in the world. Their results against the best NHL and Canada had to offer were pretty decisive. First came the Challenge Cup in 1979. This was a series between the Soviet National Team and the NHL All-Stars. Technically this was not a ‘Team Canada’ since there were 3 Swedes who were chosen for the team (Anders Hedberg, Ulf Nilsson and Borje Salming). Despite that, most people essentially thought of it as a renewal between hockey’s 2 biggest powers, including Bobby Orr who referred to ‘Team Canada’ in an interview after game 2. The NHL managed to win game 1, 4-2 after a 3 goal first period. The 2nd went to the Soviets 5-4; despite the fact the NHL built a 3-1 lead early in the second. Game 3 was the beginning of a low period for Canadian hockey. A period when it became obvious ‘they’ had surpassed us as the preeminent hockey power in the world. The teams played an uneventful, scoreless first period. In the second the game broke open with the Soviets scoring 2 goals, one on the power play. In the third, the floodgates opened when the NHL stars pressed and the smooth skating and quick passing Soviets took advantage of every mistake their foes made. They pumped in 4 goals in trouncing the NHL All-Stars by a humiliating 6-0 score. There was a collective pause after this game and a lot of questions asked. Many liked to cite the fact it was the ‘NHL All-Stars’ losing to the Soviets, not Team Canada: as if the 3 Swedes in the NHL’s lineup lost the game for them. It was the beginning of a lot of lame rationalization and cheap excuse making made by Canadians when matchups with the Big Red Machine didn’t go very well. The 1981 Canada Cup was the next big matchup that proved to be very telling. This was at a time when the New York Islanders were dominating the game with a solid, physical game at both ends of the rink. The Montreal Canadiens they were not. Their best forwards, Bryan Trottier, Clark Gillies and Mike Bossy, were high scoring but not particularly mobile. They also weren’t particularly adept at moving the puck up ice quickly. Never were these things more apparent than in the Canada Cup. I remember watching the tournament and thinking to myself just how incredibly slow and lumbering we looked, especially against the Soviets. It wasn’t just the Islander stars that appeared to be skating through sand, either. It was the case with most of the roster. Watching the games, it would be difficult to tell yourself they weren’t better at the game’s core skills than we were. Sure we had players who were great skaters (Lafleur, Gainey and Perrault), but they were the exceptions on the roster. The entire Soviet team moved the puck out of their end and into the offensive zone in a way we were never able to. Somehow they were learning things we weren’t. This is when it started to come down to ‘Canadian Grit’ in order for us to win international tournaments. The Canadians were actually the favourites going into the tournament. They fielded a mostly experienced team, especially at forward. The round robin went well for Canada, including the final game of the initial portion of the tournament, against the Soviets. 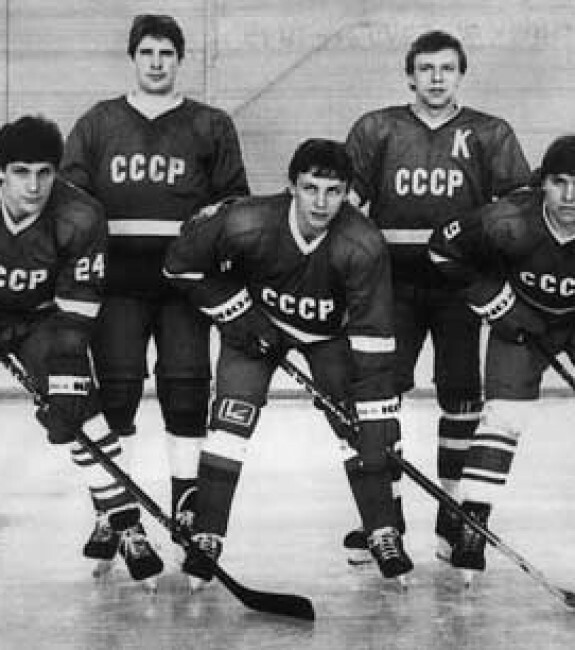 The Soviet team was relatively inexperienced as a result of starting to rebuild after the 1980 Lake Placid Olympic debacle against the Americans. Going into the 3rd period the teams were tied at 2 before a 5-goal outburst by Canada in the third, leading to a 7-3 drubbing of the Soviets. The win secured Team Canada 1st place and a matchup in the semi-finals against the fourth place Americans. The semi finals went as expected with Canada handling the Americans 4-1 and the Soviets building a 3-0 lead and then cruising to a win against the Czechs by the same score. The final would be the matchup everyone was hoping for from the beginning. Players, hockey people and fans were all very confident going into the game since they’d handled their rivals in the round robin. Canada controlled the play and had several good scoring chances but could not beat Soviet goalie, their old nemesis, Vladislav Tretiak. The teams traded goals early in the 2nd, before the Soviets scored 2 more, including a power play goal, to take a 2-goal lead into the 3rd. The final period became a Canadian nightmare as the Soviets took complete control and turned the game into a rout. The Canadians were never able to threaten and their opponents scored on almost every opportunity. The final score was USSR 8 Canada 1. The game’s most memorable ‘highlight’ was probably Vladimir Krutov’s goal 5 minutes into the 3rd. Canada turned the puck over in the offensive zone and the Soviets broke up ice with Krutov faking a slap shot and waltzing by Guy Lafleur, who was playing defense on the power play, and blowing a shot by the Canadian goalie, Mike Luit. Here’s the full original CTV broadcast of the game. The excuses and the what-ifs used by the commentators (Ron Reusch and Tom Watt) are especially hilarious as the Soviets pile it on in the 3rd. Listening to them you would have thought Tretiak had to make 50 saves in the game and that he was the only reason they won. Krutov makes Lafleur look foolish at about the 2:09:00 mark. Take note of the amount of times Canada’s best offensive players dump it in to gain the zone. The embarrassment was compounded by the trophy controversy after the tournament. The winners were under the impression, and rightly so, they would be taking the Canada Cup trophy home with them. Tourney organizer, sore loser and convicted criminal Alan Eagleson informed them they did not get to keep the trophy. It took a Winnipeg businessman’s efforts to right the wrong. George Smith took up a collection, commissioned a replica Canada Cup trophy to be made and presented it to Soviet diplomats. Even though there were plenty of explanations presented for the loss by the ‘experts’, this may have been the point where we finally started to learn our lessons. Speed began to be emphasized more due to the success of the Edmonton Oilers and the way they played the game. The Canadian Amateur Hockey Association’s ‘Program of Excellence’ was started in 1982 to develop a national junior program. It included the creation of the U17 and U18 programs to help identify younger players who might qualify for World Junior tournaments and help develop them into those roles using a summer training camp. Eventually the 3 junior leagues across Canada cooperated despite having to give up some of their best players for the WJHC tournament over the Christmas – New Year’s period. Hockey skills camps continue to be run by Hockey Canada for players in order to develop skills at a younger age. Canada won the last 3 Canada Cups in 1984, ‘87 and ’91, though it was more a victory of heart as opposed to skills in 1984. It lost the ‘World Cup of Hockey’ in 1996. There was a lot of turnover for the 1984 team but it still included many of the usual suspects, namely the aforementioned Islanders. More skill and speed showed up on later teams, including ’87 with Mario Lemieux joining Wayne Gretzky and the Oilers core. Also, on ice strategy became more sophisticated on later teams as passing skills and spacing on the attack improved. Canada’s disappointing 4th place performance in the 1998 Olympics lead to the Molson Open Ice Summit in August 1999. Representatives from the NHL, NHLPA, CHA and Hockey Canada met to discuss Canada’s future goals in hockey and how to meet them. Eleven recommendations for change were identified and a plan was put in place to meet them. This continues to be a blueprint for hockey development in Canada and the respective parties continue to meet on an annual basis to ensure they are met. Canada continues to develop more hockey players than any other nation and produces players as skilled as any on earth. It’s not nearly as easy to tell a Canadian player from a Russian, Czech or Swede as it once was.